Wholesale Prices Decrease for Third Consecutive Month - Cox Automotive Inc.
Wholesale used vehicle prices (on a mix-, mileage-, and seasonally adjusted basis) decreased 1.62 percent month-over-month in January. 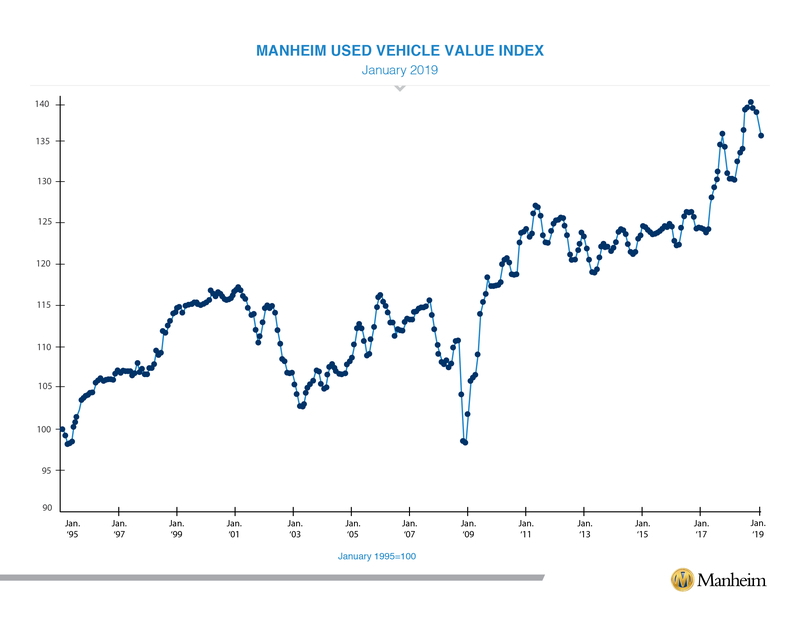 This brought the Manheim Used Vehicle Value Index to 135.4, a 3.3 percent increase from a year ago. Looking at trends in weekly Manheim Market Report (MMR) prices, January saw a continued price depreciation trend similar to what we saw at the end of last year. Three-year-old vehicle values in aggregate depreciated at a faster pace than normal, especially for the beginning of the year. Mix shifts can be more pronounced in the first few weeks of the year, which makes it more difficult to determine a clear directional trend. On a year-over-year basis, most major market segments saw seasonally adjusted price gains in January. 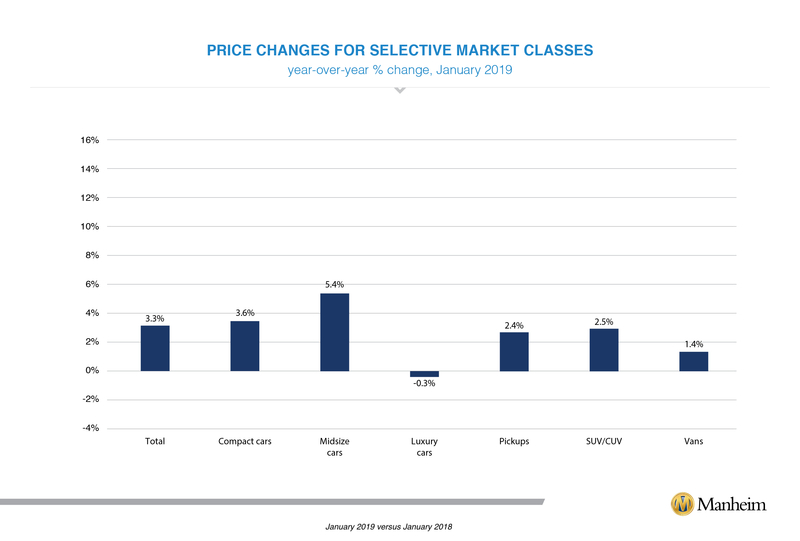 As was the case throughout 2018, more affordable vehicles continued to see the greatest increase in values in January. Compact cars and midsize cars outperformed the overall market, while utility vehicles and pickups underperformed the overall market. Weak retail results for vehicle sales in January. According to Cox Automotive estimates, used-vehicle sales volume was down 1.1 percent year-over-year in January. We estimate the January used SAAR to be 38.8 million, down from 39.2 million last January. January new-vehicle sales were down 2.1 percent year-over-year, with the same number of selling days compared to January 2018. The January SAAR came in at 16.6 million, down versus last year’s 17.1 million. Cars continue to see declines, as sales in January fell 4.8 percent compared to last year. Light trucks outperformed cars in January but were also down, finishing the month down 0.8 percent year-over-year. Combined rental, commercial and government purchases of new vehicles were up 10.2 percent year-over-year in January, and down 3 percent on a month-over-month basis. Rental (+16 percent) and government (+6 percent) fleet channels were up year-over-year in January. New-vehicle retail sales were down 5 percent in January, leading to a retail SAAR of 13.4, down from 14.2 last January. New-vehicle inventories came in under 4 million units for the ninth consecutive month. Rental risk pricing strengthens. The average price for rental risk units sold at auction in January was up 3.5 percent year-over-year. Rental risk prices were up 0.2 percent compared to December. Average mileage for rental risk units in January (at 47,000 miles) was up 5 percent compared to a year ago and down 3 percent month-over-month. Strong employment conditions yet weakening confidence. The Employment Report for January was better than expected as 304,000 jobs were created when analysts had expected only 165,000. However, some of that increase was a result of a substantial downward revision to what had originally been reported as a similar increase in December. December was revised down to 222,000 from 312,000. Wage growth remained at 3.2 percent year-over-year, which is the highest level of wage inflation since 2009. Consumer confidence declined again in January as expectations for the future declined substantially. The January confidence index was the lowest since July 2017. 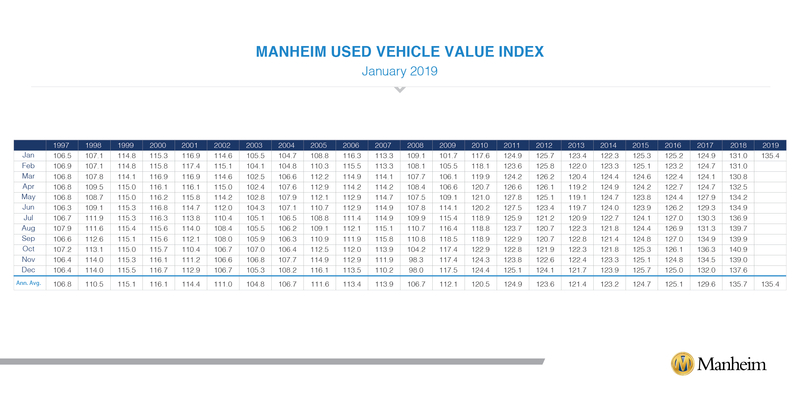 The Manheim Used Vehicle Value Index data file is available. Download here.